The high rate of death for black infants showcases the virulent brutality of institutional racism. Recent data collected by the US government has found that black babies are twice as likely to die as white babies. And, according to reporting done by ProPublica in 2017, black mothers are 243 percent more likely to die of pregnancy or childbirth-related causes than white women. This injustice is explicitly racist and transerveses class—just look at the near-fatal pregnancies suffered by Beyonce and Serena Williams, two of America’s most prominent black women. Christin Farmer of Cleveland, Ohio is working to change these staggering statistics in one of the nation’s worst states for infant mortality. The 32-year-old formed a small collective of community-based doulas called Birthing Beautiful Communities (BBC). Unlike midwives, who are healthcare providers that actually deliver babies, doulas are birthing coaches that guide you through pregnancy. The goal of Farmer’s team of doulas is to reduce the high infant mortality rate in Cleveland’s toughest neighborhoods by providing free support to women during their pregnancy, delivery, and through the baby’s first year of life. Farmer and her staff of 20 black women face problems around birthing that are even more severe than the already disconcerting national statistics. 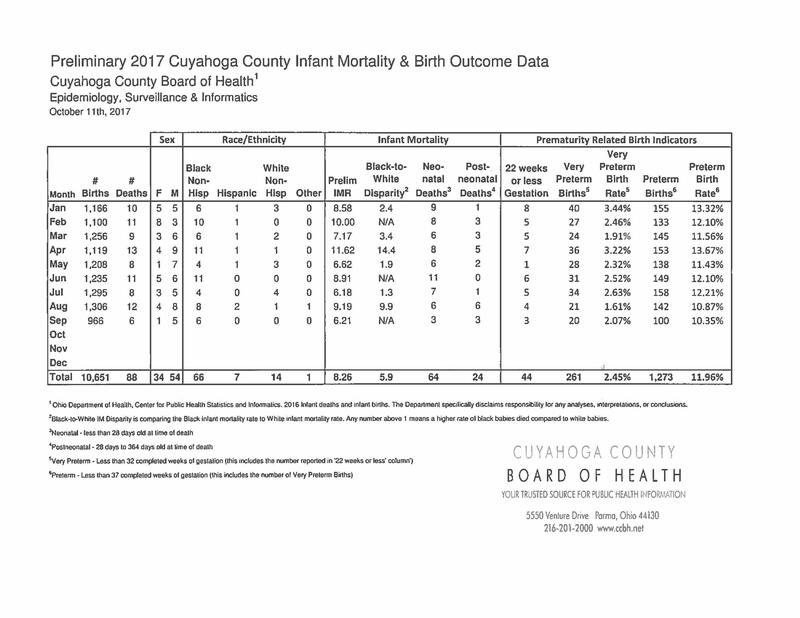 Ohio’s black women have the second highest infant-death ratio according to a January 2018 report by the Center for Disease Control. And in 2016 in Cleveland, where BBC is based, the mortality rate for white babies was 4.8, while for black babies it was 14.9. Preliminary data in 2017 has suggested that the death gap ratio between black and white babies has widened, as there was a 45 percent decline for white infants and a slight increase for black infants. Luckily, BBC is there to help make a difference. Since 2015, the organization has assisted over 50 women. Farmer strives for her organization to model the principles of sisterhood to help demonstrate equality, solidarity and support to heal pain and trauma experienced in Cleveland’s communities of color. Through programs like Sisters Offering Support (SOS) Circles and parent development classes, the group continues to thrive. In July, the organization was recognized as a “National Best Babies Zone” by the Kellogg Foundation for their achievement in tackling disparities. At the event, Farmer addressed the ongoing problem of infant mortality in Cleveland as well as her initiatives to turn BBC into a social enterprise. I caught up with Farmer to discuss the organization’s origins, some of the initiatives presented at BBZ, and her commitment to modeling sisterhood and equity for the community she serves. Were you always interested in birthwork? Since I was 16, I always knew I wanted to be a midwife and open up a birthing center. Doula work, however, never crossed my mind. In high school when my best friend got pregnant, I became so obsessed with her and her baby, so that solidified my passion for it. I studied as a nursing major in college but it was challenging. Then I applied to a program for certified professional midwifery that didn’t require a nursing degree. I was denied admission. It completely shattered my life plan, but it became a blessing because it pushed me to form BBC. I then put out a PSA on Facebook asking if people knew women in Cleveland who did this work or wanted to do this work and the ball got rolling from there. Did you all start off working full time? We were just volunteers at first. I remember telling them, we’re really going to make this full time, I just need y’all to ride with me. Then, we all eventually ended up leaving our other jobs and taking it to the next level. I’ve noticed there’s a lack of representation of women of color in birth work. It’s disheartening considering black women were always midwives delivering everyone’s babies, including their own. We know negative stigmas were attached to black midwives in the South and the movement toward the practice of gynecology as well as the ridiculous level of certifications all plays a part of it. It cost money to get those credentials and who’s got the money to send black women to school when African Americans are 228 years behind in economic wealth compared with their white counterparts? Did this impact your reason for starting BBC? Absolutely. I thought I was the only black doula in Cleveland, which was extremely odd considering our infant mortality rate. So, I reached out to organizations to secure funding to train women who were culturally appropriate and culturally centered for these central communities. Could you talk about some of the objectives you proposed at the Best Babies Zone? A few of our objectives include hiring a program manager to help oversee and connect for profit businesses in the economic development sector and the health sector, having an administrative campus and birthing center to serve as a healing space specifically from a grassroots perspective, and hiring a black male psychologist. A healing space seems like an interesting concept. Healing trauma in our community is an objective that’s very important to me. For African Americans, we’re dealing with at least three types of traumas at any given time. For example, we deal with generational trauma or issues that have been born out of slavery and the social conditioning adapted from those challenges. As birthworkers, we see this (trauma) in the form of emotional detachment from mothers with their children. Speaking of stress, what are common ones you find in the women who attend SOS circles? It comes from your family life. You could be a single parent, or have a unsupportive husband. It’s also your environment; an anxiety of violence or fear of personal safety. Or pressures of pursuing better education and job opportunities. The women who work in corporate often deal with microaggressions and disrespect, causing a lot of internalized stress that they begin to normalize. These stressors are all the same no matter a women’s socioeconomic status. Can you talk about your reason for modeling sisterhood in BBC? Without a doubt, [sisterhood] is the foundation that has lead to our success. Before I hire the women, I have everyone sign an agreement outlining five principles. If you violate them, then you have to go. It’s for the women receiving service. We have to be able to demonstrate to them the possibility of having meaningful relationships with other women. I’m not saying that people don’t rub each other the wrong way sometimes. But, it’s this respect, love, and support that’s trickled down to our men and our children. It’s then that healing and equity begin. Speaking of equity, what does it mean to you and how is it modeled at BBC? Equity is putting a surplus of opportunity in front of people who have been historically deprived of it. That is what we do. We take people in from the community, hire them to work at livable wages, pay a flat fee for every birth they attend, and give them benefits. It’s funny because a lot of people say they know what equity means and if they do, they don’t implement it or have the tools to implement it. What’s been the impact since launching BBC? We recently did a qualitative study and in it the women talked about our practices as a whole for them and the city. We’ve introduced a new perspective, an example of equity and most importantly demonstrated that black women are doing this work. For most people, it’s shocking to discover all the people who work here are black. People always want to know who my boss is, they think it’s someone white. My Chief Operating Officer always laughs because people always think her boss is white, like, No, she’s black, too. We run this. It’s us modeling what a sector—economics, health, business, community—can look like if implemented the right way.